Do any supplements enhance Armor meds? Like magnesium or selenium? If so would it be helpful to take it with the Armor? I too have been taking Levothyroxide for twenty five years or more. Also on Lansoprasol and Felodopine. This is how I take mine: first the Lansoprasol, 30 minutes later Levoththyroxide. Have breakfast then take the Felodopine. Will be 80 years old next year and have never had a problem. Walk at least 3 to 4 miles a day. Not eaten meat for 30 years but have a lot of fish especially salmon. Beginning to wonder if I have the times all wrong! Maybe if I change them I could walk further! Good luck and good health to you all. i take my leovothroxine in the morning after i drink my coffee about 45 min to 1 hour is this wrong? Is it ok to take hormone (estradiol) at the same time as synthroid, or should that be taken apart? Estradiol lowers the effectiveness of thyroid medication, it’s usually best to take 1 in the morning, and the other at night. I am a Synthroid user, I also have moderate to severe redness on my face. Have been to dermatologist, no diagnosis.could this be connected to thyroid . I have a fourth of a thyroid, due to thyroidectomy. No cancer, just many cold nodules. Probably rosacea if you are British blood, seems to affect us more then others. I have been taking levothyroxine for the better part of 30 years. I am amazed that anyone taking it is not up to speed on the basics of when to take it. For at least the last 15 years, probably more, the infomation attached to the medication explains you should take it on an empty stomach, first thing in the morning. 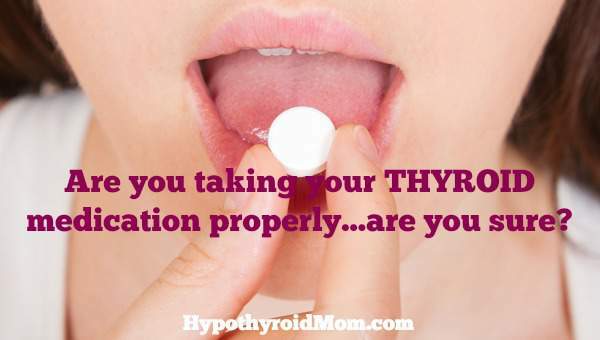 THe instruction to take it 30 mins to 1 hour before eating, and to take it at least 4 hours before taking antacids or vitamin/mineral supplements is printed on the prescription label on your pill bottle. I know there is more included on the additional material attached to the prescription bag, and since I am not on any other medications, I have not recently read the remainder of the instructions. It is imperative you read the information given to you with your prescriptions!!! 30 years for me too. & I agree read instructions for all meds. You mentioned Zoloft. How does this interfere? When should each be taken? I too take mine in the morning followed by my coffee 30-45 minutes later. I used to wait an hour but heard 30 minutes is okay. Not sure if there’s any problem with it.